3 or 4 years, on a basis of one hour every week with the professor. bringing out the aptitude to become integrated into professional life. Study of traditional and modern repertoire on all saxophones. 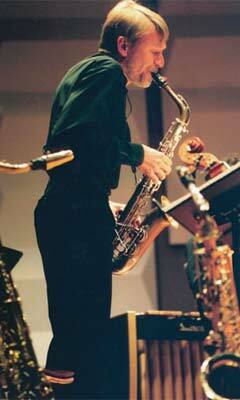 The study of the alto saxophone, the soprano saxophone and the tenor saxophone is compulsory. The study of the other saxophones is optional. Transcriptions will be used for the introduction to the soprano, tenor and baritone saxophones. The students form teams (sonata with piano, saxophone quartet, saxophones ensemble). The saxophones ensemble of the Conservatoire (12 saxophones) works in sessions in accordance with the concert planning. Regular practice for recital is proposed, and memorization work is strongly encouraged. Given that the main aim of the studies at the Conservatoire is acquiring autonomy, students are required to carry out real research work. 4) an active collaboration with the composition classes; each student will have to perform at least one premiere of a composer-student of the Conservatoire. On the students suggestion, Claude Delangle will invite a composer who will do work on his piece in the class. The first year will mainly be devoted to reaching the standards of knowledge. In the second year, it is possible to carry out and exchange with a foreign institution of the level of the Conservatoire (minimum two months, maximum three months). In the third year, recording sessions with the conditions of the execution of a record are proposed. Besides, students have the possibility to get to know how to play with an electroacoustic device (magnetic band, Syter device, etc…). In the third year and beyond, students are strongly recommended to prepare for international competitions. 2) a piece chosen in agreement with the professor. For no 1 and no 2, posted two months before the exam. This programme may be identical to the programme for the recital of the Prix. 3) one or two self-choice pieces, depending on the total duration of the programme. Control exams: distinctions: Très Bien , Bien and Assez Bien (first class honours, second class honours and pass grade) or radiation (fail). a certificate in one optional additional discipline to be chosen by the student. The distinction ( Très bien, Bien, Assez bien) qualifying the degree is the one awarded by the jury at the end of the recital of the Prix. The Diplôme de Formation Supérieure de Saxophone, with the distinctions Très Bien or Bien, allows the student to enter the admission exam for the post-graduate cycle. (Cf. technical section for the post-graduate cycle/instrumentalists).